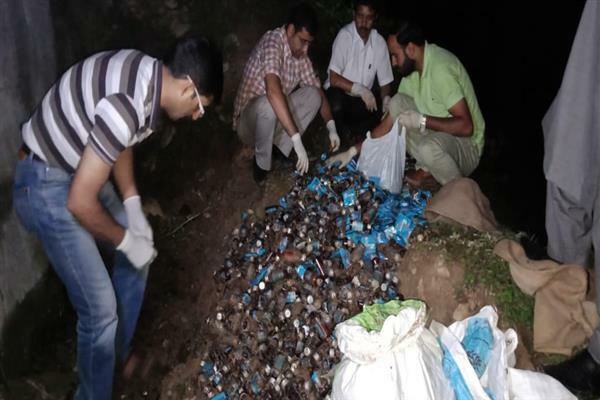 Srinagar, Jul 20 (KNS): The drug and food control department on the intervening night of Thursday-Friday recovered medicines worth Rs five lakhs from Gogal Dara forest area of Tangmarg. Sources said that soon after the medicines went missing, the higher authorities of the department received a complaint, urging the officials to take action. After receiving the complaint, the higher ups constituted a team comprising Assistant Drug controller North Kashmir, Muhammad Bashir, Drug Inspector headquarter Baramulla Yousuf Mohi-ud-din, Drug Inspector Pattan Tangmarg, Shabir Ahmad Pandit. The team headed by Assistant Drug controller North Kashmir recovered the medicines including Anti-biotic, ORS and costly drugs worth Rs five lakhs at around 10:30 pm. The locals expressed shock over the issue, saying that the people are being deprived of the medicines while as the officials in the department are doing such unfortunate things. They also demanded investigation into the matter and appealed the authorities to take strict action against the involved persons. Meanwhile, Drug controller Kashmir, Lotika Kahjuria hailed the work done by the team ho recovered the medicines. DG Health Service, Dr Saleem-ur-Rehman told Kashmir News service (KNS) that the an investigating team including Chief Medical Officer (CMO) Budgam, Baramulla Khaag and others has been constituted to investigate the matter. He also said that the team has been asked to furnish the report in one day.